One of the drummers in the military procession in the Quay of the Fortress of Louisbourg in Cape Breton, Nova Scotia, displays his drum sticks as he tucks them inside his uniquely designed belt of his uniform. The band plays at the Fortress of Louisbourg before the cannon gun firing with the soldiers dressed in their bright red uniform. Details of the drummers uniform in a military procession in the Quay prior to the cannon gun firing at the Fortress of Louisbourg, Louisbourg National Historic Site, Highway 22, Fleur de lis Trail, Marconi Trail, Cape Breton, Nova Scotia, Canada. 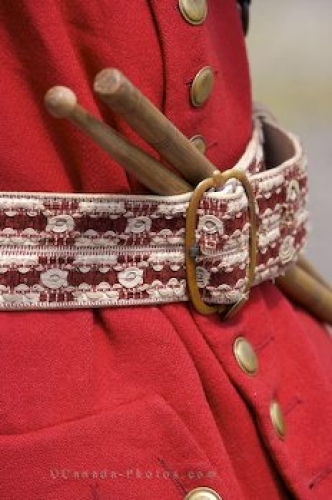 Picture of the belt on the military uniform where drum sticks rest in Louisbourg, Nova Scotia.